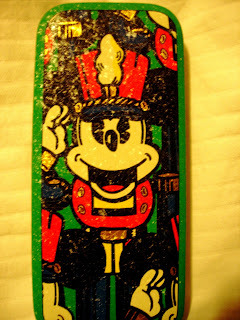 This is a Mickey Mouse Nutcracker Watch, which I bought at The Disney Store circa 1995. It has been worn before, although only during the Christmas season. I suppose that it could be worn all year long, but it would seem kind of weird to some people. 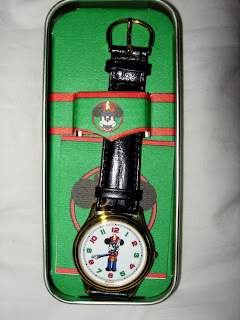 It is fun to wear something special for the Christmas season, and this watch is a beauty. Check out the tin that it's in, too. Pretty cool, huh? This is one of my favorite watches. Mickey is kind of military here; it kind of reminds me of one of those Michael Jackson videos, where he's commanding all these Czech soldiers in the Square. 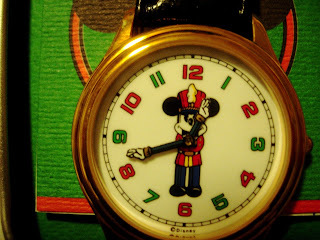 I can't wait until Thanksgiving, so I can break out this cool watch and wear it to Disneyland during the whole Holiday Season!